This elegant dress has waved hem tiered tulle skirt. Perfect for any special occasion, wedding , first communion dress and party dress. Q：How can I choose the size I want? Upper body tight, lower body loose style, it's elegant and full with princess temperament . Shinny little drill embellished between the petals, and it looks adorable. Want to make your child the center of the stage? Want to be praised and appreciated at various gatherings? 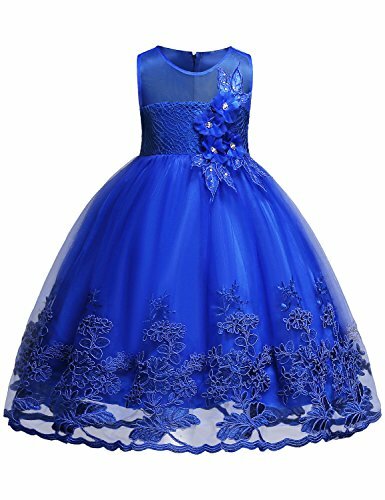 We are committed to creating the princess dress that can help you realize the princess dream in every girl's heart. Flower Embroidery Tulle Design and with comfortable clothing lining,it looks elegant and beautifully, stain ties back for waist adjustment. Suitable for daily wear and special occasion like wedding, ceremony, birthday, pageant etc. Both gently hand wash and dry-clean are recommended. Use mild detergent and hang dry, but do not bleach, and use hot water. It will lengthen the use of your princess dress. ♞NOTE♞: This dress is smaller than the standard size, it is recommended to buy a size up. Size Table means age ranges for girl, but they are for general guidance only. If you have any questions about this product by Blevonh, contact us by completing and submitting the form below. If you are looking for a specif part number, please include it with your message.